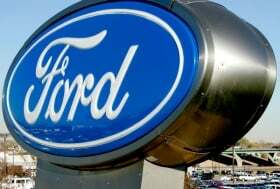 “Ford now has a healthy and sustainable operating model,” Moody's said. DETROIT (Bloomberg) -- Ford Motor Co. and its finance arm had their credit ratings upgraded one level by Moody's Investors Service because of demand for the company's new models and a lower cost structure. Ford, the only major U.S. automaker to avoid bankruptcy last year, has cut 47 percent of its North American work force since CEO Alan Mulally arrived from Boeing Co. in 2006. The automaker earned $2.7 billion last year, reversing three years of losses. U.S. sales have increased 33 percent through April, and Mulally has said the company will be “solidly profitable” this year.